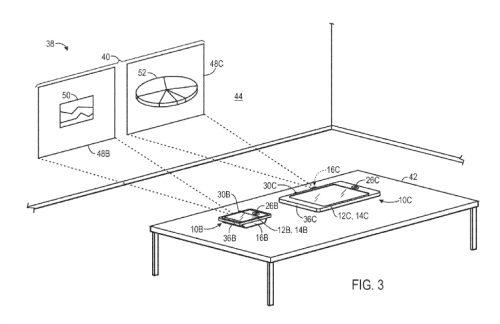 Ever since I first explored the use of Pico Projectors, I've mentioned that it was only a question of time before Apple looked to incorporate the technology into their iOS devices, and here is a patent application from Apple which goes some way to proving that theory. United States patent application US 2011/0197147 was originally filed in Feb 2010 and is called Projected Display Shared Workspaces. Generally, the patent talks about how 2 or more projected displays, each from a separate device, could be displayed adjacent to one another to produce a shared workspace. Images displayed on one of the projected displays may be copied or transferred to another projected display within the shared workspace. Each device may also contain a cameras that can be used to detect gestures on its projected display so that a user can transfer images between displays using simple gestures. Devices that could be used include any type of electronic device capable of displaying projected images and recognizing gestures through a camera. Suitable devices which are specifically mentioned as examples include an iPod, iPhone and MacBook. Also mentioned is the important realisation that whereas a single camera can be used to determine movement in x and y spatial directions relative to the projected display plane - 2 or more cameras may operate in conjunction with one another to detect the spatial z direction . One or more communication interfaces will provide channels that allow the devices to share information and control settings for the shared workspace. Other related topics are discussed in more detail in the patent (see link above). Now, I believe, it's only a question of time before some of these features start appearing in the market. Will Liquid Cooling be Coming to the iMac? 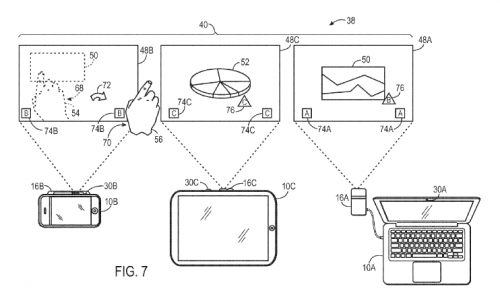 A recent article in WorldCAD Access is reporting a recent Patent application from Apple for manipulating 3D models on multi-touch displays. Another tool to assist when searching for, or examining, patents. The aim of the Gauss Project, is to open up the patent system to Software Developers by allowing them to browse Software Patents granted by the European Patent Office. Microsoft and Autodesk both deny infringing patents on 'product activation' technology. A recent story reports that a trial in a Texas court began on Monday (Apr 10) in which Z4 Technologies Inc claims Microsoft and Autodesk appropriated its patented technology for methods of securing software to reduce unauthorized use. The European Patent Office provides a useful source of information related to Patents. and in particular use the worldwide search engine at esp@cenet for searching patent documents. IBM, of course, in #1 position with 2,972 patents but falling below 3,000 for the first time since 2001. Details of the top 25, provided byIFI Patent Intelligence, a Wolters Kluwer business, are shown in a report on the Yahoo Financial News site. A follow up on this story relates to an initiative by IBM to improve the quality of patents by improving the way applications are vetted. The initiative will also work to establish open-source software itself as prior art against patent applications. To get there, the OSDL and IBM plan to work with Novell Inc., Red Hat Inc. and VA Software Corp.'s SourceForge.net to develop a system that stores source code in an electronically searchable format. This code repository, which IBM officials said will satisfy legal requirements to qualify as prior art, would allow patent examiners and the public to use open-source code to ensure that patents are issued only for new software inventions, according to the IBM statement.